Representatives NCR and FLC signing contract considering NCR tax transfering on mutual benefit. Another securing NCR taxes went according to plan. NCR with allies made another financial transaction successful and NCR secured tax income. NCR appologize for any inconvenience that may have been experienced by civilians, and strongly suggesting to stay outside of Shady Sands during NCR tax transaction. Check your bank account and enjoy your paycheck! NCR secured another tax transaction. If You neglect mentioned codex, you are risking your own life and your own loot. NCR is not responsible to compensate any person who lost items by neglecting mentioned conditions. wearing robes in Shady Sands is still against law, by wearing robes you will be considered as thief and law breaker. Feel free to stay in Shady wearing gear that is not hiding Your name! In every other case You are welcomed to visit Shady Sands. NCR secured another tax transaction thanks to NCR Army and allies. Also thanks to all civilians for patience and understanding of curfew hour during tax transaction. Most active members got 50% bonus on their paycheck account. NCR tax transaction was secured! Amount of caps remains confidential in NCR interest. NCR thanks to every brave NCR soldier and NCR Ranger as well to every ally and supporter. Transaction went with minor incident that happened after taxes was secured. Marginal gang of drunken raiders wanted to enter town and break plans of NCR by force, but Republic army with ally forces pushed them away from Shady Sands entrance easily. NCR thanks BoS who kept neutral and supportive status in Shady Sands during curfew hour. Instead of regular paycheck for this period, NCR government secured "NCR IKE"* - initial kit of equipment - for every NCR soldier and NCR Ranger. Fill out official request form and send it directly to president for approval. Shortly after you will receive your IKE in Rangers camp. Shady Sands guards are payed and now their basic equipment contains "T4", highest tier of protection for citizens and visitors. Feel safer and feel free to visit Shady Sands parameter while staying in law boundaries! NCR government reserves rights to lift curfew hour during tax transaction in Shady Sands. Civilians, please keep yourself updated on current NCR laws on NCR territory before visiting to avoid possible misunderstandings! NCR peacefully secured caps from taxes for past three weeks period. 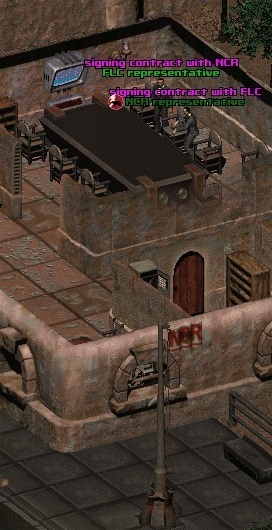 Caps will be disposed for upkeep of Shady Sands guards and NCR investments. NCR thanks to every NCR Army member as well as to allies and supporters. Contact president for your IKE package for past 3 weeks period. Shady Sands guards are equipped with t4 for Your protection! Thank You for Your patience during curfew hour. Shady Sands premises are opened for peaceful visitors. Shopkeepers in Shady Sands are back from strike! Feel free to come and browse Shady Sands shops! NCR secured tax transfer income without any troubles. Thanks to all civilians and citizens for patience and understanding during curfew hour in Shady Sands. NCR government thanks to all ally sides, who came in large numbers to support NCR tax transaction and prevent any possible outlaw break on Shady Sands premises. Special thanks to all NCR army personnel who participated in Republic progress and guarding peace during tax transaction time. For past 3 weeks NCR secured paychecks for their active* personnel. Check Your bank accounts on your pipboy and enjoy bonuses. Feel safer. Shady Sands guards are now equipped with "T4", highest tier of protection for citizens and visitors. If persons are interested to support NCR on bank tax transaction day, they are obligated to contact any NCR higher ranked personnel at least 24h before tax transaction begins, to meet requirements and be approved by government. Whole transaction didint went without incidents. Terrorist attacked and tried to steal caps by bringing battle on Shady Sands premises. After dealing with threat known as MUKHOSRANSK fight resumed against gang known as BBS. NCR with allies; Talon Company, Unity of Broken Hills, Midnight Riders, and No Fate suffered heavy casualties, but at the end restored law and order on NCR boundaries, after main goal of securing taxes was achieved. Thanks to all civilians for understanding during curfew hour in Shady Sands. If any civilian feels his rights was neglected is free to file a complaint to NCR officer or directly to president. For past 3 weeks NCR secured paychecks with bonuses for their *active personnel. Members Roughneck(ApocMan)and Wild Xero will be additionally rewarded for their contribution to NCR. Feel safer. Shady Sands guards are now equipped with "T4" this week, highest tier of protection for citizens and visitors. With start of transaction, robber gang tried to steal NCR property. 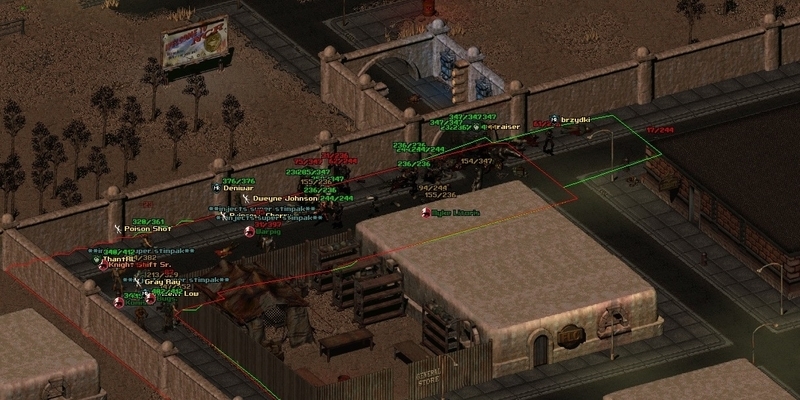 NCR with allies pushed them out of town, restoring law and order in Shady Sands. NCR thanks everyone for participation and especially support. Also, thanks to all civilians and Citizens for understanding and following instructions during curfew hour. Feel safer. Shady Sands guards are now equipped with "T4" this week, highest tier technology of protection for citizens and visitors. "When you call the democratic NCR "oppressors" and "imperialists" while you proceed to crucify a harmless trader, who was simply walking along the road, because he was in the way of your division who is marching to burn raid and then invade a peaceful village." Transaction passed in peaceful manner, according to the protocol. For past 3 weeks NCR secured basic paychecks for their *active personnel. Check Your bank accounts on your pipboy and enjoy earned caps. "Too many people have opinions on things they know nothing about. And the more ignorant they are, the more opinions they have"
NCR secured tax transaction with some minor issues. Few drunk and high on jet raiders, as autopsy showed, tried to do criminal acts on Shady Sands premises. NCR Army put their raiding intentions down very quickly. NCR is in possession of intelligence that attackers were payed from organized criminal groups to try to make damage on Republic property. Threats are nullified and order was not intruded. NCR thanks everyone for participation and support. Also, thanks to all civilians and Citizens for understanding and following instructions during curfew hour. Feel safer. Shady Sands guards are now equipped with "T4" this week, highest tier technology of protection for citizens and visitors. Welcome! Keep away from suspicious persons, persons in robes that hide their identity. Report any suspicious activity to NCR Army personnel. NCR secured tax transaction without any problems. Transaction in Shady Sands went according to protocol without any major digression from laws. For past 3 weeks NCR secured paychecks with mediocre bonuses for their *active personnel. "One farmer from Modoc lost his last shovel." As our information was showing, huge attack by Enclave happened just before tax transaction, supported by outlaws known as BBS. Not long before FLC officials should open the bank vault doors, Shady Sands started to be under heavy Enclave artillery attacks. President Knight Shift and council members were evacuated immediately by the protocol. NCRA with allies suffered heavy casualties. Huge material damage is done to Shady Sands on key locations and buildings. Taxes were not recovered by NCR officials and are counted as stolen. NCR didint and wont surrender! After main attack passed, and most of enemy left or was pushed out of town, small raider groups tried to take control over territory and fight over scraps. 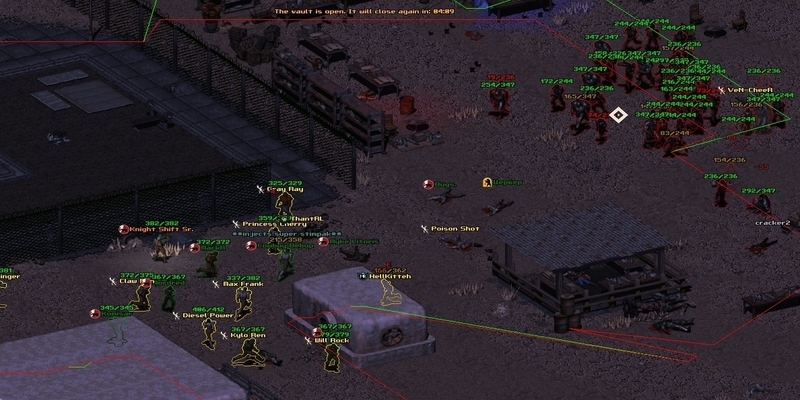 Soldiers of NCRA and allies managed to maintain communication networks, gather units that were left on battlefield and push them outside of Shady Sands securing town premises. NCR thanks our brave troops and allies for support in hardest times. NCR mourns with families of killed in this coward attack. NCR government immediately started to work on rebuilding NCRA ranks, Shady Sands and security of town premises. Government representatives are in contact with Hub and Vault City officials who offered help in rebuilding Shady Sands. Project "Rebuilding the NCR" will be done in phases. Plans are prepared and will be published in next days. For these purpose urgent Council meeting is arranged. For the first time outside of NCR Capital. Paychecks are suspended for period of rebuilding Shady Sands. Available units, report to your superiors and ask for your IKE set of gear and new duty assignments. Civilians that are not part of project "Rebuilding the NCR" - be aware - do not stay on town premises for longer period. NCR currently can not provide resources and manpower to protect whole town parameter. For your own safety, town points of interest are moved closer to main gates. Citizens, you are free to stay in shelter of NCR embassy premises and safe houses around Hub and Junktown during period of Shady Sands rebuilding. Educated Citizens in next branches please report to NCR Hub embassy representative: doctors, technicians, scientists, carpenters, miners, masons. Available NCRA forces are in high state of alert. Scouting patrols are searching for valuable sources of resources that can help in rebuilding Shady Sands. Remaining troops are dispatched to important locations in and around town premises to observe any further potential hostile activity. "Once I was best hexer in the wasteland. But then I took an arrow in the knee." Last month spreadsheed, presented on council meeting, is showing that NCR made great economic progress. State Secretariat of Economy, with approval of president, secured wages for active NCR personnel for period of past month with included bonuses and compensation for period of suspended paychecks. Check bank account on Your pipboy and enjoy earned caps. "I remember when XL used .223."